When seeking help for flight phobia, anxious fliers need to protect themselves from “junk psychology.” It is not surprising that internet advice on fear of flying is junk. But, in spite of brain scan research that has taught us how the mind regulates anxiety, most books on fear of flying offer little effective help. Courses sponsored by major airlines such as British Airways and Virgin Atlantic promote the same inadequate “tools” used in 1975 by Captain Truman “Slim” Cummings in the first fear of flying program at Pan Am. The British Airways course – actually conducted not by BA but by a company owned by a BA pilot, and the Virgin Atlantic Course – last only a day, morning lectures ,and an afternoon group flight. In all these places, anxious fliers are told they can control their anxiety, panic, and claustrophobia by controlling their thoughts via selective focus and by staying relaxed with breathing exercises. The advice is based on a false claim that feelings are caused “top-down” – the result of thoughts. It is amazing that intelligent people can ignore the fact that feelings can also be caused “bottom-up” by the release of stress hormones, something that happens naturally – and correctly – when a passenger feels the plane drop. Selective focus and breathing exercises did not work in 1975. I know; I was there assisting Captain Cummings. It was deeply distressing to see people doing the breathing exercises exactly as we taught them to do them, and do them in a state or panic, or even terror. These exercise did not then; they don’t work now. Let’s see why. Selective Focus: when focused on something, the amygdala’s job is to monitor what the person is not focused on, and to zap the person with stress hormones if it notices anything non-routine or unexpected. This serves a purpose: to force the person to notice something that may be a threat. If a person falls off a ladder, on the way to the ground, they are in free-fall, a zero-G state. The amygdala is sensitive to that feeling. It should be. After all, when falling, a person needs to drop whatever they are focused on and figure out how to keep from getting hurt when they land. No matter how focused a person may be on a book or a movie, when the plane drops in turbulence, stress hormones are released. These hormones force the person to take notice. It is impossible to stay selectively focused on a movie or to pretend you are on a beach. Breathing exercises can promote relaxation; but only in a calm protective environment where a person can let their guard down. Few people—certainly not anxious fliers—regard an airliner as a calm protective environment. Whether the advice comes from the internet, from a book, from a course, or from a therapist, advising an anxious flier that a breathing exercise will control their fear, claustrophobia and panic sets them up for failure. Airline courses include a group flight, accompanied by a pilot. Participants may appear to have overcome their fear. Nothing could be farther from the truth. Fear is temporarily controlled by group support, and by reassurance by the accompanying pilot that everything is alright. Since relaxation and reassurance courses do not produce psychological change, anxious fliers are rendered helpless to control their feelings when they attempt to fly solo. Follow-up research has shown that anxious fliers who take courses based on reassurance and relaxation are no better off six months later than before their course. 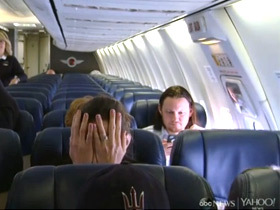 A few months ago, ABC asked if SOAR would take part in a feature on fear of flying with Diane Sawyer. We agreed. We proposed a plan to have several anxious fliers go through the SOAR program. ABC was expected to video them before the course, and then again when the flew afterwards. We didn’t hear from ABC for a while. Then, ABC aired the feature using a course based on reassurance and relaxation. On the video, the pilot running the program claims breathing exercises can—and will—control an anxious flier’s fear when they fly. Though pilots who offer these relaxation and reassurance courses mean well, they cause psychological damage. When a course participant is later unable to fly, he or she had no way to know the course was inadequate. They blame themselves for failure, particularly when the course is sponsored by a major airline. Sadly, this is often true when anxious fliers are treated by professionals. Most therapy—whether cognitive or exposure—offered by professionals is also inadequate. Anxious fliers who consult cognitive therapists are all too often given relaxation exercises and told to stay focused on something other than the flight. They are told they can only get better if they recognize their fear is irrational. CBT cannot stop the stress hormones that are triggered when the plane drops. Each time the plane drops, the amygdala releases a shot of stress hormones. In turbulence, there is one drop after another. Bombarded with stress hormones, anxious fliers panic. Since CBT cannot prevent this, the therapist may tell the client panic will not kill them and try to help the client tolerate panic. Virtual Reality Exposure Therapy (VRET) is, to say the least, questionable as a flight phobia treatment. I was consulted by the researchers before and after the original VRET research, The treatment group was given several hours of VRET treatment. A control group sat for a few minutes on a parked airliner. Those who sat on the parked airliner showed better long term results than those given extensive VRET treatment. But, rather then accept that their treatment had failed, the VRET promoters claimed the research proved VRET to be “equal to a traditional fear of flying program.” Since VRET could be conducted in a psychologist’s office, its promotors claimed it to be a “convenient alternative” to a traditional fear of flying program. The claim worked; reputable psychologists purchased the VRET equipment. Apparently they failed to recognize that a traditional fear of flying program involves a lot more than a parked airliner: several days of instruction, desensitization, and one or more actual flights. Hopefully, in the next few years, the methods developed at SOAR based on brain scan technology and other research, as well as experience with thousands of clients, will be familiar to therapists through the book SOAR: The Breakthrough Treatment for Fear of Flying. Until then, anxious fliers will need to protect themselves from widespread junk psychology.